It’s free to attend tapings of the Tonight Show with Jimmy Fallon, but you’ll need to do some planning and have a little luck to get your tickets. Tapings of the show are opened up for ticket requests one month at a time, usually during the first week of each month. So, March tickets requests would open up during the first week of February, and so on. The specific date and time for each monthly ticket release will be posted on the Tonight Show’s ticketing page. Ticket requests are handled online through the 1iota.com website: Tonight Show with Jimmy Fallon tickets. You’ll need to sign up with 1iota in order to apply for tickets. You can do that in advance at this link. Once you apply for tickets, you’ll be placed on a wait list. Not everyone on the wait list will get tickets. If you get tickets, you’ll be notified by the show at least two weeks prior to the taping date. If you’re fortunate enough to get tickets to the show, there’s still a possibility that you won’t get in. In order to ensure a full audience, more tickets are distributed for each show than there are seats in the theater. To claim your actual ticket that will get you in the door, you’ll need to check in at the specified time (usually starting at 3:15) on the afternoon of the taping. This is when the actual entry tickets are distributed, and they’re given out on a first-come-first-served basis, so try not to be one of the last ones to arrive. Note: The show has an age requirement. You must be 16 years of age or older at the time of show to attend. You’ll need to show a photo ID as proof of age. If you didn’t manage to get advance tickets for the show, you can try your luck in the standby line. A standby ticket might get you into that day’s show if there are cancellations or extra tickets available. Standby tickets are distributed beginning at 9:00 a.m. on taping days to those in the standby line, which forms under the NBC marquee on 49th Street. The standby tickets are numbered and given out starting at the beginning of the line, so those who get there and lined-up earliest will have the best chance of getting into the show on standby. Standby ticket-holders will be told when to return to the theater for an afternoon check-in to see if you’re going to get tickets for the show. A limited number of tickets are available to watch Jimmy Fallon try out monologue jokes for that night’s show. The application process for these tickets is the same as for the regular show tickets. Visit the Tonight Show with Jimmy Fallon ticketing page for details. The Tonight Show tapes Monday – Friday. You can see a calendar of upcoming taping dates on their ticketing page. Most tapings begin at 5:00 p.m.. Audience check-in usually begins at 3:15 p.m.. The schedule sometimes varies. 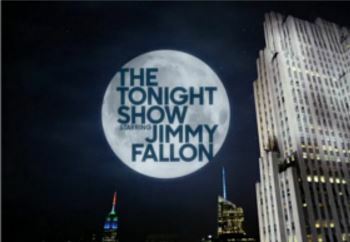 The Tonight Show with Jimmy Fallon is taped at the NBC Studios at Rockefeller Center, 30 Rockefeller Plaza.